October 24, 2009 - Recently, I had the chance to escape my office and combine a business trip with Edna research and a visit to Niles Essanay Silent Film Musuem. This was my second visit to Niles since 2004. After a morning business meeting on Saturday, and trying to avoid freeways, I checked the Calilfornia road map to find the quiet route through Niles Canyon just east of Niles. It was a route I had traveled before in 2004 on my first Niles visit. I mentioned to Michael remembering seeing an antique shop at this location. visit to Niles in January 2004. I recall it having many Chaplin items. 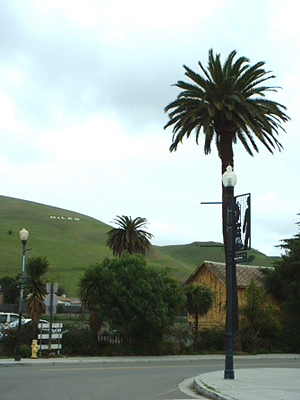 The hill side and Niles sign just east of the main street. Photo: 2004. 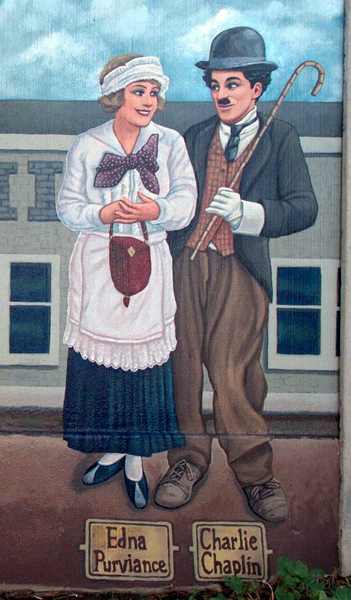 Niles Canyon highway is a two-lane road, which was the film location of 'The Tramp' (Chaplin's breakthrough film with Essanay). 'The Tramp' helped refine Chaplin's Tramp character. It was also the first appearance of his signature ending, as he trots off alone, determined to carry on wherever life took him. In an age of strip malls and new homes, seeing the canyon void of them was a welcome sight. Even Charlie and Edna would have been pleased to see the canyon still looking pretty much as it did in 1915. Upon leaving the canyon, finding Niles Boulevard is easy. Go straight at the first major traffic light. Once you drive under the railroad underpass, you will see the main street of Niles. 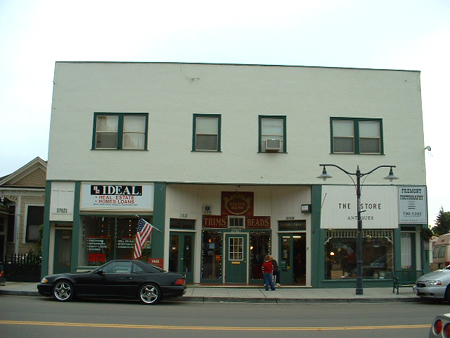 Niles was an independent town in Essanay studios days, but was later incorporated, along with four other towns, to create the town of Fremont. Niles' Main Street is one of only a handful in California designated as an official Historic District. And the Niles Essanay Silent Film Museum is a featured attraction on this historic street. The Niles Essanay Silent Film Museum is on the north end of town, near the new fire station. The Niles fire station is actually where the original Essanay Studio was located. Essanay Studio has been gone for decades, but bits and pieces of it still stand. Michael Bonham wears many hats at his job as Essanay Museum volunteer. At the Museum, I was pleasantly greeted by Michael Bonham. Michael has been volunteering at the museum for about three years. He is editor of the monthly newsletter, gives official tours, works at the museum and is acting MC during weekly programs. Michael took time from his busy schedule to give me a full tour of the Museum, which is part of the Edison Theatre. The Edison Theatre opened in 1913. 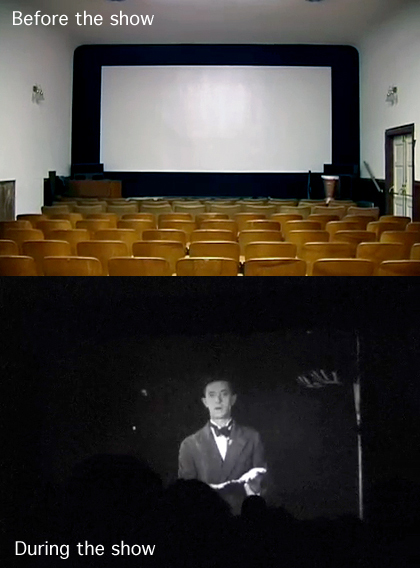 I learned on the tour that Chaplin could have previewed some of his films here, during his short stay at Niles. Over the years, the theatre fell out of use and the projection room was boarded up. When the Niles Museum acquired the building to restore it back to a theatre, the contractors removed the boards and to their surprise, found the projection room very much the same as it was over 80 years ago. There were even words scratched into the tin, telling the film projection staff where not to spit. The room was surrounded in tin to protect the theatre from fire from the highly flammable nitrate film. But black and white nitrate film did have a beautiful visual quality, that has been hard to match in this digital age. 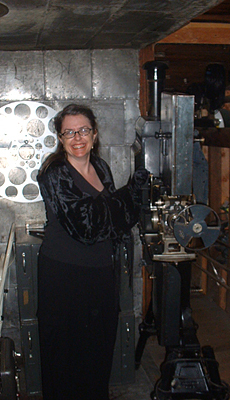 Shawna is surrounded by tin in the original Edison Theatre Projection room. Photo taken during my October 24, 2009 visit. The museum room in the back of the theatre houses early day cameras, posters, costumes, photos and even film strips (including film strips found inside the walls during the remodel). 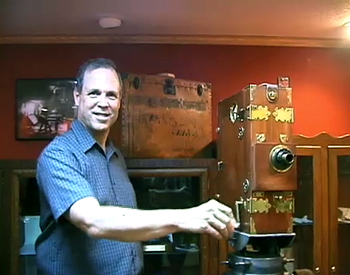 Above the museum collection is the projection room, where we viewed one of the hand cranked projectors still used today. This is where we met David Kiehn, author of “Broncho Billy and the Essanay Film Company.” David is the local historian on Essanay history and helps with the projection of films, including 'handcranking' a few films out on special occasions. In the front of the theatre is the Essanay Museum store, which houses a variety of silent film books, cards, and specialty items for film buffs. It is the first store where I got to see 'The Sea Gull' book on display. During my time visiting the museum, we were joined by Shawna Kelly, (the author of “Aviators in Early Hollywood”). It was very nice to meet Shawna, since I only met her very briefly during the Cinecon event in Hollywood in 2006. Our tour continued outside, as we paused in front of a house next to the theatre. It is a house Edna Purviance might have stayed in during her brief stay while working at Essanay. Edna, Charlie and others, were photographed in front of the house in 1915. We walked to where six of the original studio bungalows houses still exist. These were the houses where some of the actors and crew use to live. Some have been remodeled, some moved, but for the most part, still exist, pretty much the same as in the 1910s. While walking by the houses, we met a gentleman named George, who lives in one of the houses. He actually gave us a tour inside his home. He told us the story of finding an original theatre ad bill from the Edison Theatre in the walls of his basement. He gave the ad to the museum, where it is currently on display. With a full house, the evening started its Halloween themed show, with a good mixture of films, with Buster Keaton probably getting the biggest laughs with 'Haunted House.' I shot some video during the second half of the evening program with Laurel and Hardy, just to capture the atmosphere of the evening. When you sit at home and watch a silent film, you miss a big part of the silent film experience (the live music, and the laughter). So it is always fun to sit and hear the crowd giggle and roar. At this showing, the music was all brought to life by pianist Greg Pane who did a masterful job. The evening ended much too quickly, as the audience applauded our hosts for another enjoyable program. While the tickets are no longer a nickel, $5 isn't much to pay for an evening of being transported to a time when movies were still magic and film music all live. I found plenty of free parking near the theatre and reasonably priced motels in Fremont. And bring the kids too. The ticket price on average is a donation of $5 (but check the site for special prices and events). Take a jacket for those cool bay breezes or occasional foggy or rainy evenings. I had an enjoyable evening and looking forward to a return. As my Niles trip began, so it ended, the same as Charlie at the end of 'the Tramp' leaving via Niles Canyon. For more about the museum and tour, see this link to a 'just for fun' video I created about the visit. Special thanks to Michael Bonham for the warm welcome and tour. Also to A.J. (for a nice chat after the event), and to Rena Dein and the other volunteer staff, for making the evening possible for everyone. This full report was written for ednapurviance.org. website. No permission has been given otherwise. Charlie Chaplin is a trademark of Bubbles Inc. SA used with permission. Charlie Chaplin, Chaplin and the Little Tramp, the images of Chaplin's on this website and the names of Mr. Chaplin's films are all trademarks and/or services marks of Bubbles Inc. SA and/or Roy Export Company Establishment used with permission. All Charlie Chaplin images Copyright 2001-2015 Roy Export Establishment. All rights reserved.